Cook the duck breasts in the oven according to the instruction on packaging. Set aside on a plate. Cook the asparagus in salted water ro desired tenderness, drain and chill in iced water to preserve color. Dry on paper towels, cut them into small pieces and add to the mesclun salad mix. Mix all the ingredients for the dressing. Pour dressing over salad and toss. 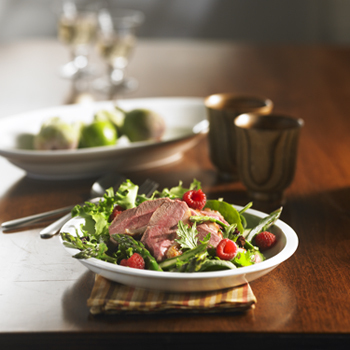 Slice duck breasts into thin strips, preferably still warm, and place them on the salad. Garnish with pine seeds and decorate plate with fresh raspberries.